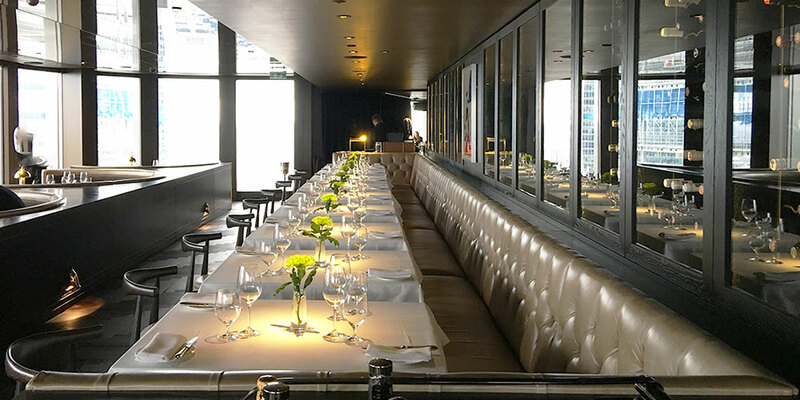 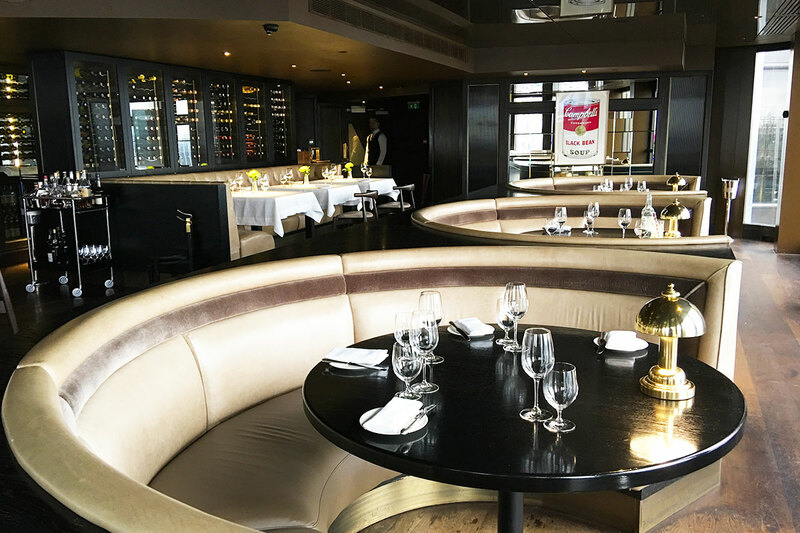 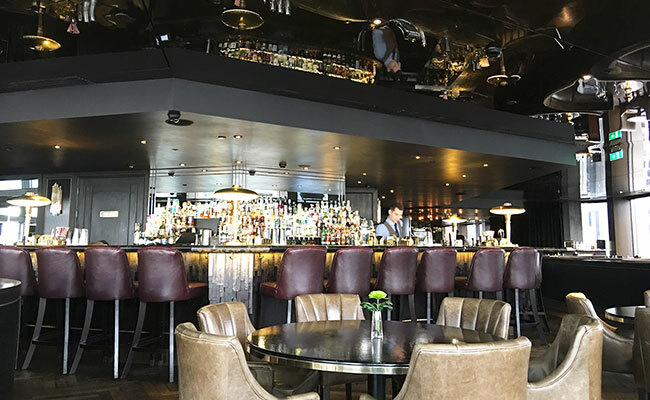 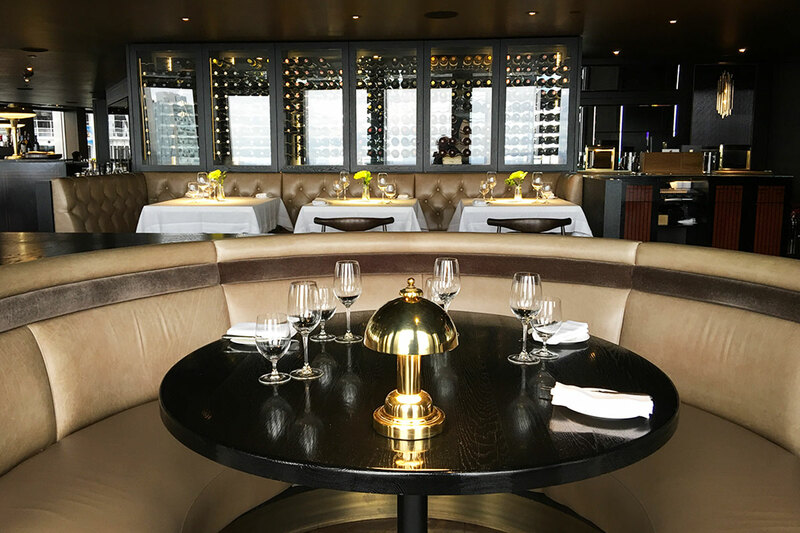 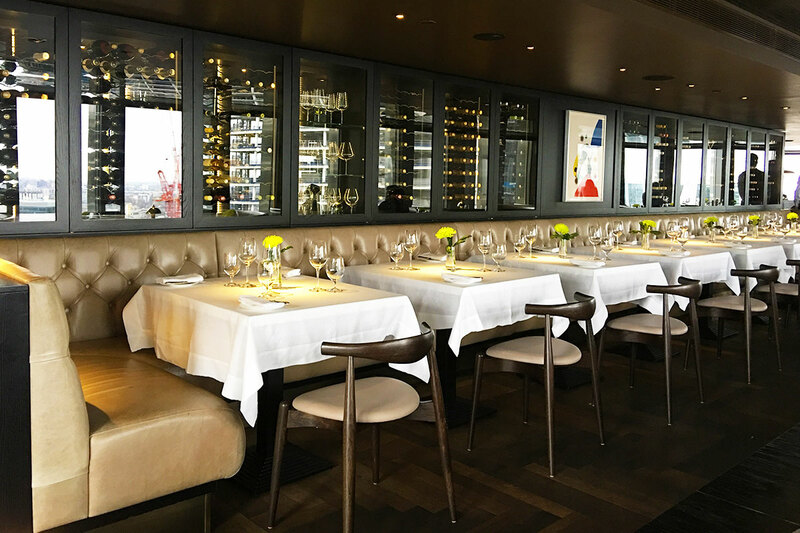 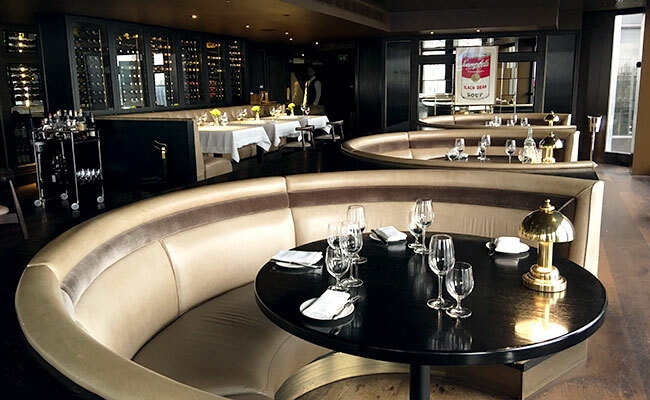 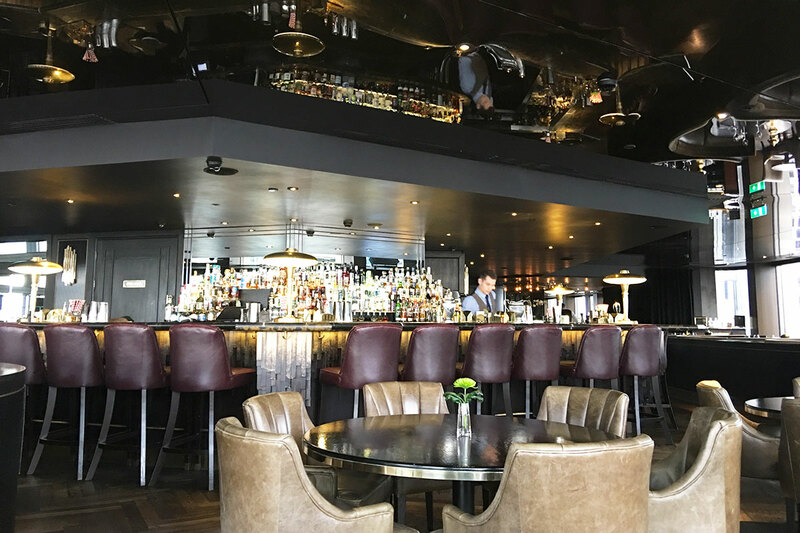 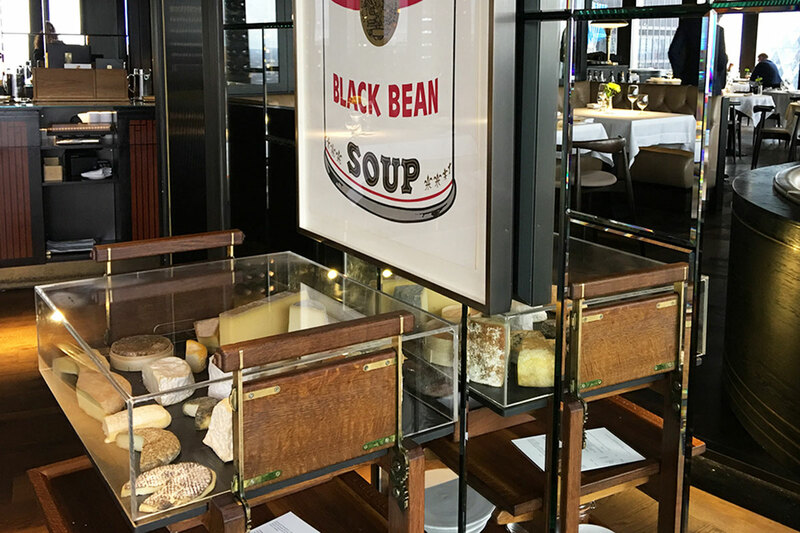 Located high up on the 24 floor of the Tower 42, City Social is an art deco inspired restaurant by Jason Atherton. 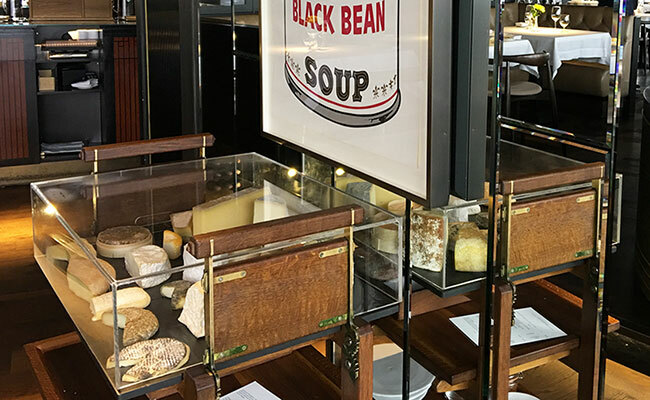 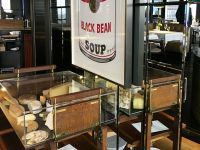 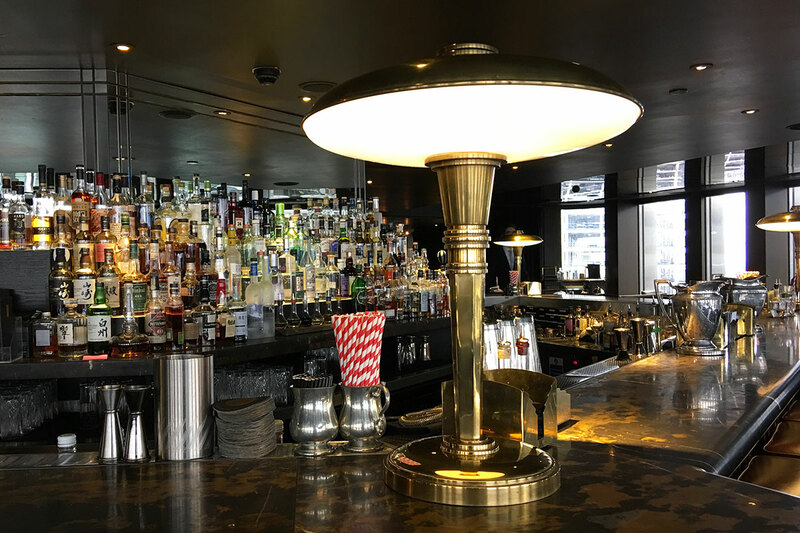 Opened back in 2014 and winning a Michelin star within its first year - the glamorous interior with a great Gatsby feel hasn’t changed but the changing views over the city building of London have become more fascinating. 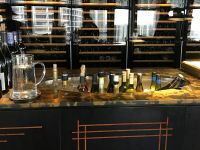 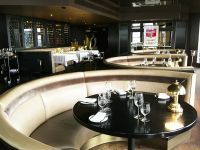 The grand cocktail bar and restaurant are segregated by means of a reception area leading off the elevator corridor with a private dining space behind set of glass doors and a chef’s table for true action experience of the kitchen. 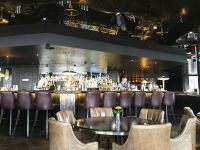 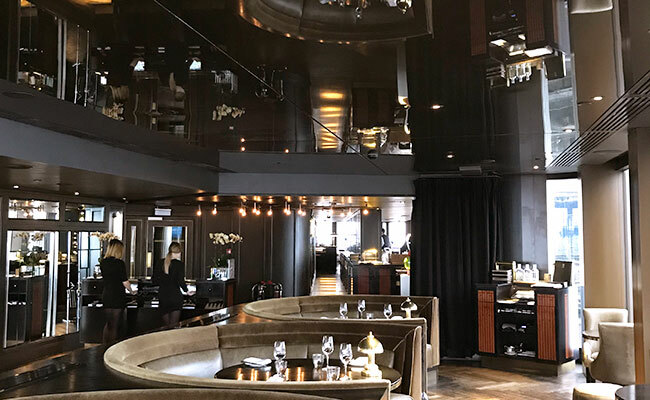 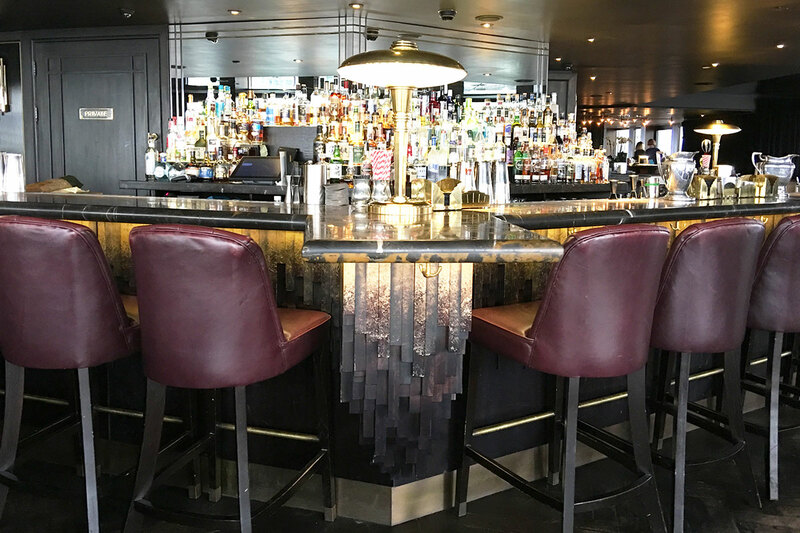 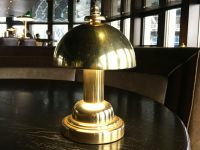 The essence of both bar and restaurant are very dark and moody surfaces with luxurious touches though classy brass light fittings and lighting effects. 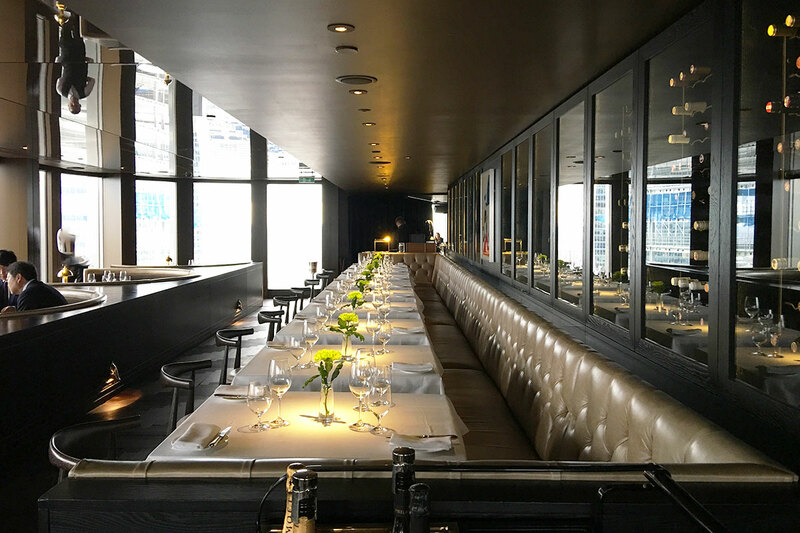 The floor to ceiling windows extend across the customer areas do give a dark interior some life and soul reminiscent of the New York skyline and a highly reflective stretched Barrisol ceiling gives the perception of extra height. 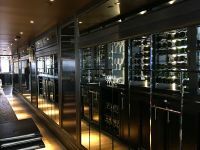 The floor is a classy herringbone pattern dark oiled oak running throughout except for the washrooms. 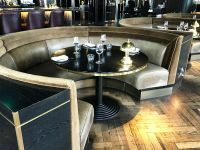 Changes within the bar and restaurant seating could easily be overlooked, for example they both use groups of round booth seating with subtle changes to the upholstery fabrics. 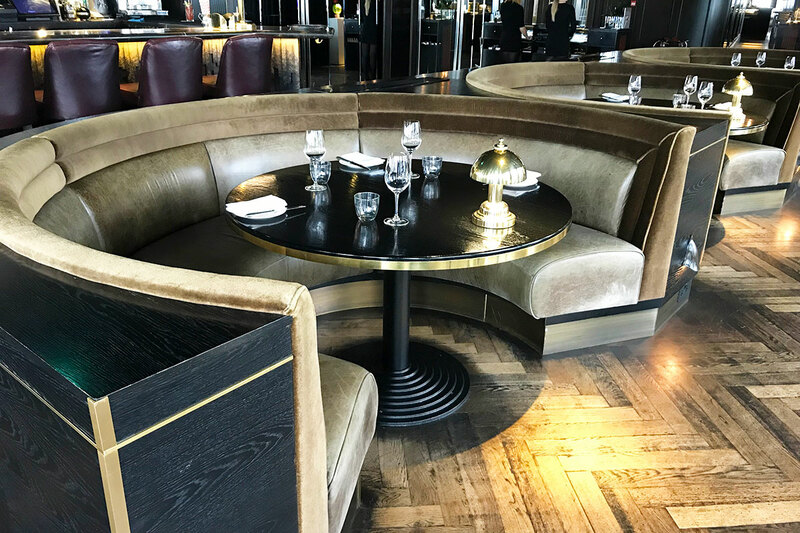 The dining area uses taupe leather upholstery and a bronze velvet detail and the bar uses more of the bronze velvet and a darker aged leather. 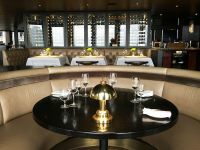 Booths are generous sizes and are orientated to take in the best of the panoramic views. A touch of class is brought to these round tables through a polished brass lamp at the end of each and a polished brass edge trim. 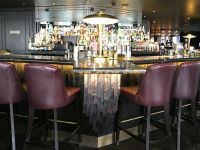 The cocktail bar is an architectural masterpiece of deep brown bullnose marble cut to radiate out from the corners and through some cantilevering genius and concealed lighting glowing onto glimmering manmade stalactites, bar top extensions appear to float in mid-air. 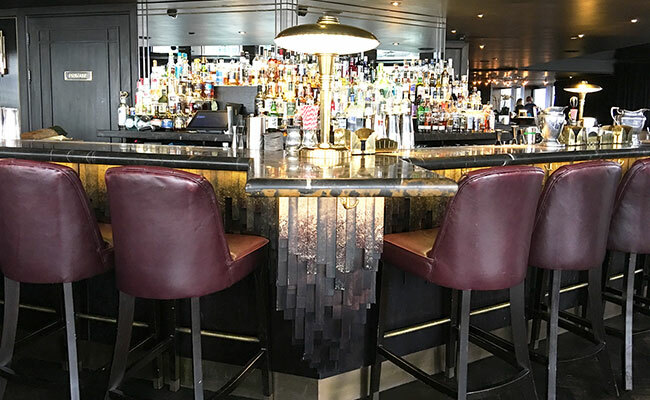 The formation of the stalactites and shining bar front and are essentially numerous overlaid bronze painted MDF strips but very well disguised as a more expensive metallic glass composition. 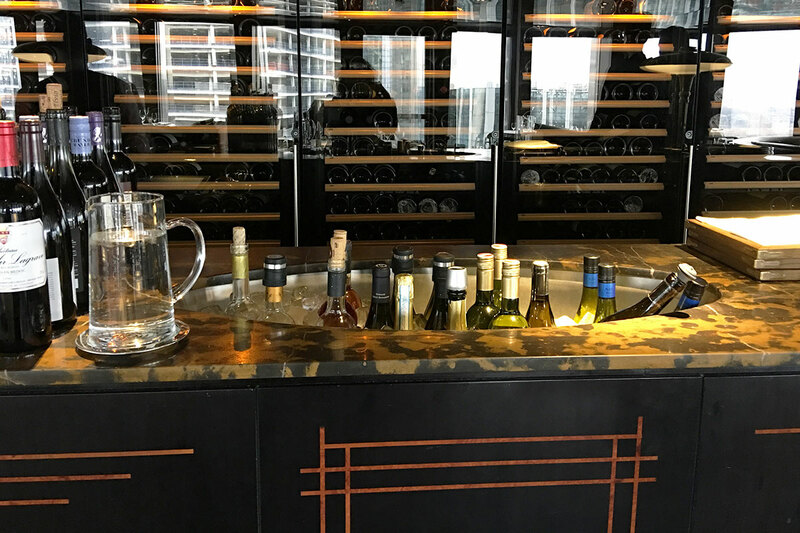 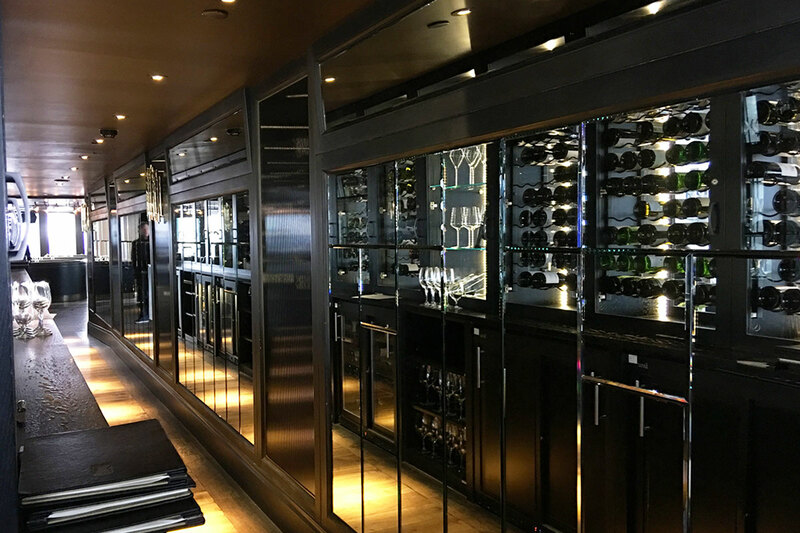 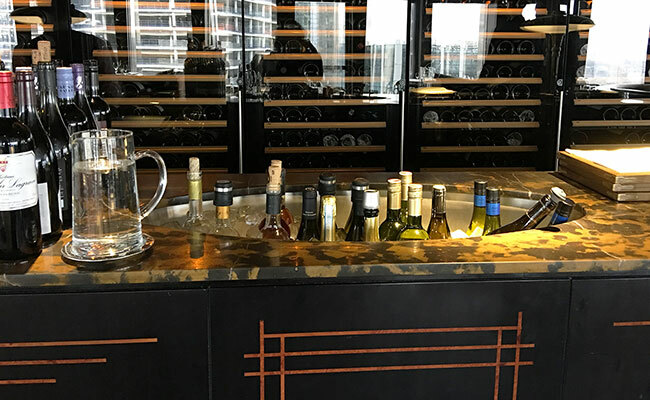 The restaurant has been cleverly arranged so the staff waiter stations are disguised as a feature wall of glass fronted wine fridges on the diner facing side and a working galley area behind. 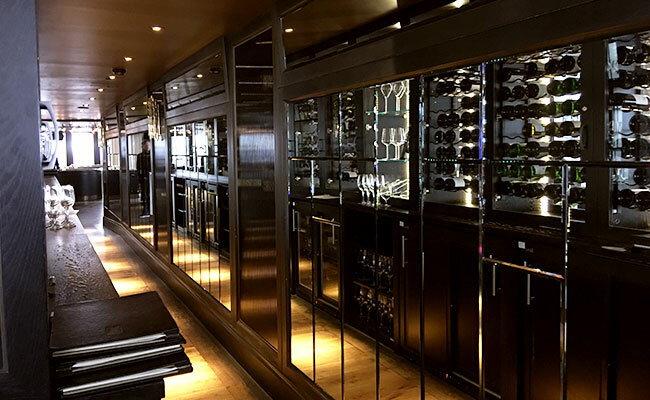 The galley itself is elegantly lined with cut art deco patterned wall mirrors and the wine fridges form a wall backdrop to the long banquette with button back leather upholstery. 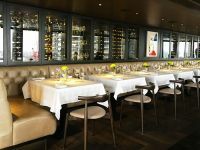 This banquette dining area seems brighter by using white tablecloth covered tables and dark oak stained wishbone chairs with pale seat pads. 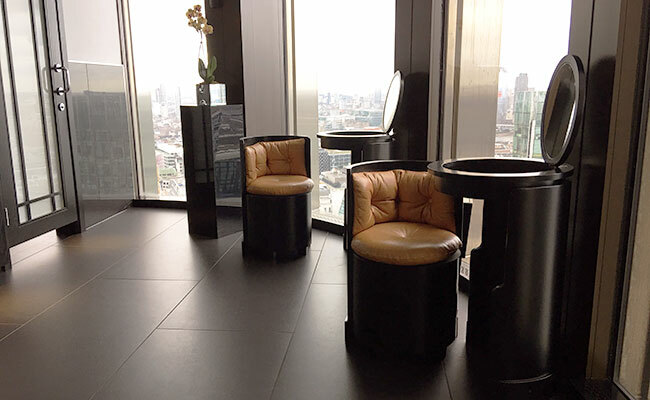 If you want a washroom with a spectacular view then it’s worth heading a look at city social’s toilets. 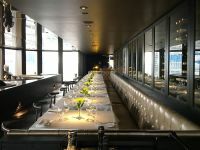 The gents have urinals directly overlooking the city below and if the ladies want to powder their nose they literally have mirrored make-up stations in the toilet lobby, also with views through the full height windows. 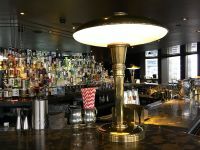 Male and females both benefit from art deco monochrome stylings with classical chrome trims, taps and soap dispensers, black marble and back illuminated marble wall lamps. 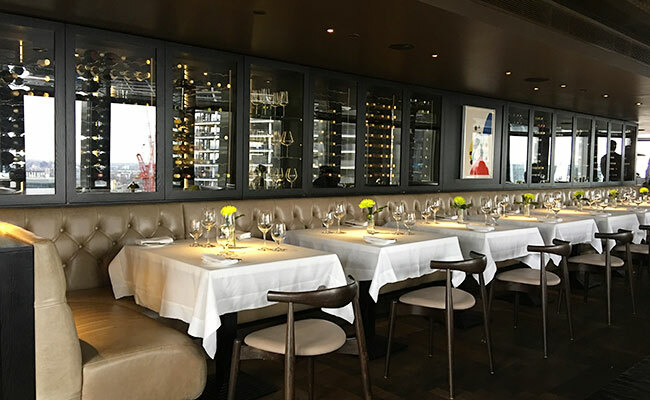 The tiled flooring is even cut to mitred joint patterns in the cubicles which are another considered detail. 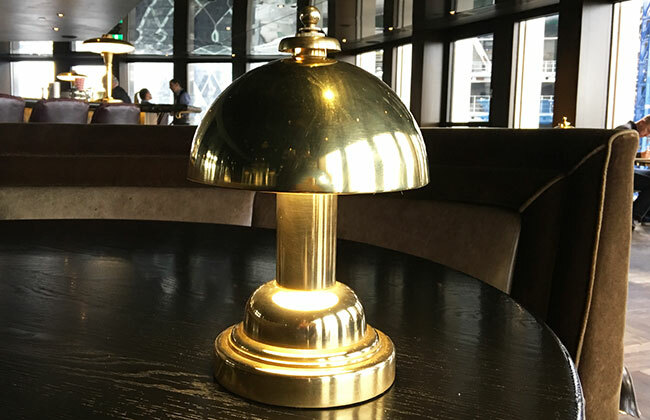 Blenheim Design really loved some of the opulent details in City Social restaurant and bar from the cut mirrors, the brass table lamps dotted around the interior, the champagne and heritage cheese trolleys and some of the finer details of the brass art deco trays and containers on the bar.